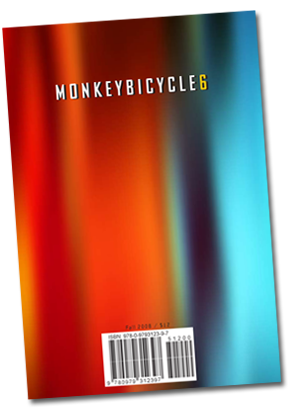 In this edition of Monkeybicycle‘s print version, we move back toward the traditional style of fine literature that we so recklessly abandoned for issue five. Loaded with dozens of incredible stories and poems from the likes of Ryan Boudinot, Kim Chinquee, Curtis Smith, Laura van den Berg, as well as so, so many more, this book is for you. Contributors: Shane Allison, Sheila Ashdown, Richard Barrett, Matt Bell, Ryan Boudinot, Kim Chinquee, Martha Clarkson, Michael Czyzniejewski, Daniel O. Harris, Drew Jackson, Jason Jordan, Jing Li, Frayn Masters, Corey Mesler, Cristin O’Keefe Aptowicz, CS Reid, Nora Robertson, Sarah Salway, Curtis Smith, Tyler Stoddard Smith, John Spiers, Joe Sullivan, Matthew Summers-Sparks, Twixt, Laura van den Berg, Cody Walker, Brandi Wells, and Jay Wexler.